How did the Flat Cad guys do this morning? Did they back up yesterday's pass? When they fired the engine this morning they found a head gasket leaking. They are changing the gasket and should run again today. Did anyone catch whether #8217 H/DT entry (Aaron's Salt Machine) 1981 VW Rabbit pickup was able to set a new record this morning. It looks like his last run yesterday should have qualified. The record as of yesterday morning was 105.581 mph. I was shooting the cars (and bikes) in the course 2 staging lanes and was about to head over to the course 1 lanes when Iran into Dan Kaplan. He said, "are ya syre ya wanna leave this course?" and pointed to something that had just come into view: The Richmond & Stark AA/FS car fixin to make its very first run on the salt. I shot these photos of it and I'll stick around to see how the virgin run goes. Very nice looking. Thanks Ray. wow that is pretty! Twin engines? 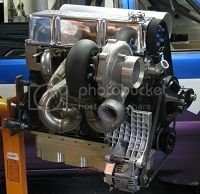 Dang, I need to talk to these blown 2 stroke guys about oil pump for turbo!!!!! Anyone know them? Awesome pictures Ray! Keep em coming! Yes. 2 386" Chevy Smallblocks. Since it was the virgin run, Lee Kennedy paced it as they pushed off. After both engines were making a little power, they shut it down; I figger that's as planned. And there's always one photographer who selfishly spoils things for everybody else. Help I can't find it! I have been looking for something that would help me see what kind of car Stainless was driving before the crash. The pictures posted here after the crash don't give much clue as to what the car looked like before. Just curious as to how different parts for the car held up under those kinds of forces. Part of building a new car and wanting to learn and be safe. If you can help me with this I would appreciate it. Glad that he is OK and will return but it is sad the car is gone. Amo Steele streamliner: http://www.landracing.com/forum/index.php/topic,4840.0.html thru 2011. The pictures of a crash posted in this thread was of Johnny Hotnuts vehicle, I havent seen any of the Amo-Steele streamliner. I guess you didn't go thru all the posts on this thread, then. Reply 248 shows a photo of it. There will be until officials put ropes and designated areas for crew, spectators and photographers. Most organizations do that but it may take someone getting hurt before they take better control. Great new Streamliner, 4 wheel drive? Are motors physically joined or independent like MT's Autolite car and Noel Black's? OK now the fog is clearing. The crash photos are of Hotnuts car and now i am not sure if the Amo-Steele streamliner also crashed. I am thinking now that it did not. Is that correct? Thank you Ray for the great coverage and stories. You make the pain of not being there a little less intense. Hope I didn't accidently start a rumor that the streamliner crashed. Avanti, yes the Amo-Steel 'liner did crash the other day.